In the sixteenth and seventeenth centuries, man’s understanding of his position in the universe was changing. But neither the mathematical calculations of Copernicus nor the observations of Galileo had provided proof that the Earth moved. Empiricism demanded a demonstration. After working for months in his Paris cellar, Foucault succeeded in 1851 in suspending a five-kilogram brass bob from a two-meter steel wire so that it was free to move in any direction around the vertical. As the pendulum swung in a fixed plane, Foucault was able to view how the rotation of the earth caused its orientation to shift. Galileo had insisted in his Dialogue Concerning the Two Chief World Systems, that “all experiments practicable upon the earth are insufficient measures for proving its mobility, since they are indifferently adaptable to an earth in motion or at rest,” but the untrained Foucault had shown otherwise. 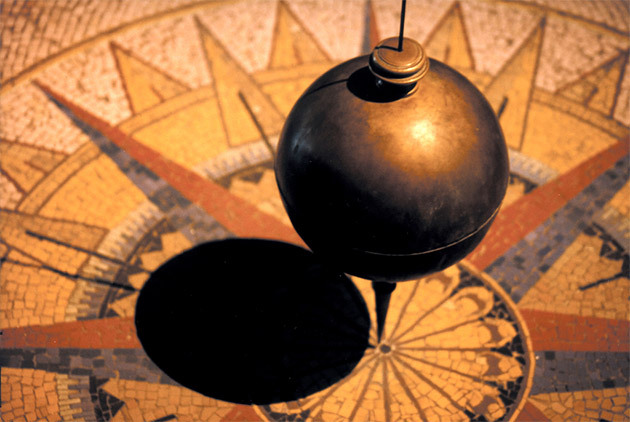 After viewing a demonstration of Foucault’s pendulum at the Paris Observatory on February 3, 1851, the mathematicians and physicists of the French Academy of Sciences could not deny that they did “see the world turn.” But they quickly became incensed that their lifetimes studying rotations, gravity and astronomy had not led them to imagine and perform what many of them called Foucault’s “beautiful experiment.” Refusing to give Foucault his due because he was not one of them, they scrambled to justify their own shortcoming and minimize Foucault’s achievement, barely mentioning his work in technical reports of the year’s scientific activity. It is likely that Foucault would never have received the recognition he deserved, including nomination to the Academy of Sciences and the Legion of Honour, without the support of President/Emperor Louis-Napoléon Bonaparte, who had a deep personal interest in science and was devoted to progressing the nation by promoting scientific ideas.